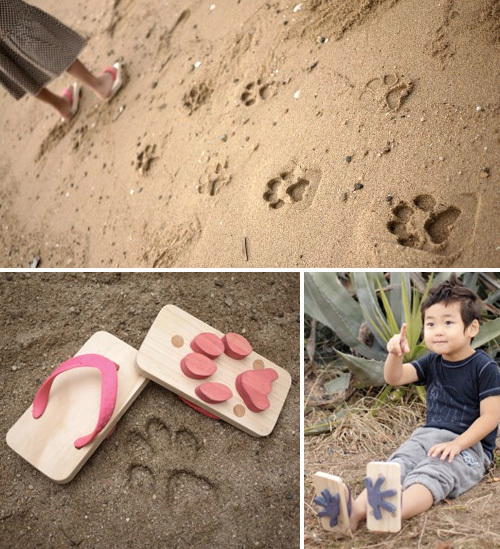 Ashiato Footprint Sandals Let Your Kids Stomp Around Like Animals | OhGizmo! I remember a time when social status was dependent on how cool the tread on the bottom of your shoes were. That was many, many years ago, of course. But if I had a pair of sneakers that left behind bear paw imprints wherever I roamed, I would have ruled my grade one class. Times have changed, but I’m hopeful that kids will still appreciate these Ashiato sandals which feature rubber animal footprints on the underside. Including those from a cat, owl, gecko, monkey and something called a ‘zaurus’ which is an animal I’m apparently unfamiliar with. The sandals don’t look like the best solution for everyday wear and tear, but for a trip to the beach I’m pretty sure your kids will occupy themselves for hours on end, leaving behind mysterious footprint trails. Available for ~$29 to ~$32 (€22 to €24) from Kiko+, depending on the size.